Halifax natives Vogue Dots record as a core two-piece featuring Tynan Dunfield and Babette Hayward, but for their Gridlock gig, they fleshed out the lineup with the addition of two drummers (both of whom play together in a band called Budi). 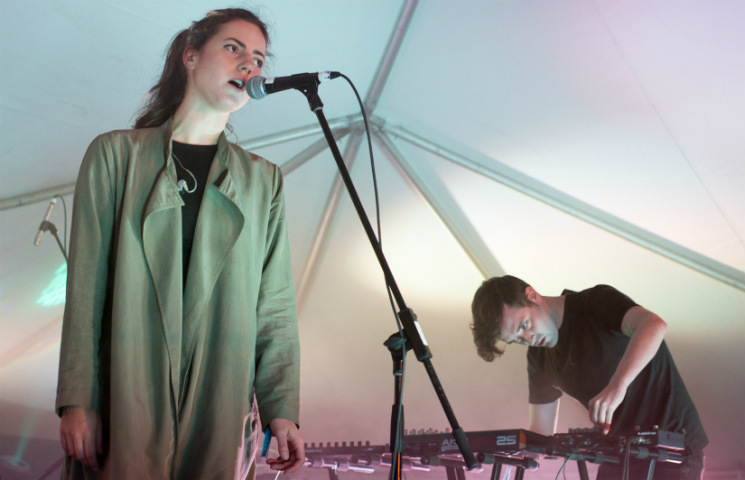 Their refreshing electro-pop sound countered the miserable rain falling beyond the festival's tented walls, welcoming early evening attendees with moody synths, fierce beats and the melodic acrobatics of vocalist Hayward, who sounded particularly great when in her warmer, raspier lower register. They nobly tried to turn the huddled mass of soggy onlookers into the early stages of a rave, and managed to get some swaying and bouncing enthusiastically along to new songs like "Mauka" and "Florals" beneath the colourful stage lights, but there wasn't much variation in sound throughout the set, and by the end it became riddled with technical difficulties. There were glitches that didn't sound intentional and a false start followed by abandoned songs, but they persevered with impromptu drum fills and banter hyping the other bands on the bill. It wasn't a particular smooth ride to reach it, but single and set ender "Way with Silence" provided a final high note, closing out with what is obviously the most polished cut in a still-young, high-potential catalogue. Vogue Dots "Way Out" / "Thunder"